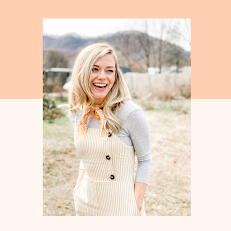 You know the ladder, the one that exists in your mind, the one that continually reminds you of where you stand in society, the proverbial playground of status, and most definitely, the one that determines your relationship with the one who made you. When you’re up, you’re up, and when you’re down, you’re down, and there is no in between on this ladder; nope, you’re either AMAZING or a nobody; ALL or none; EVERYTHING or nothing at all. The ladder in our minds. Does anyone else struggle with the idea they are not enough? And by “not enough,” I am not referring to the social pressures of “not enough,” such as I’m not that pretty, or I don’t have that car, or boyfriend or job or house or closet or shoes or whatever else seems to be trending at the time, clamoring for my attention. Please don’t think I am undermining all those things, but it's just that I do not believe those are the roots of our struggles. Those are all façades we hide behind to make us feel a momentary sense of arrival. Ok, I won't speak for you; those are façades I hide behind to attempt to make me feel a quick sense of arrivalness. Is “arrivalness” even a word? Well, it should be. The “enough” that I am referring to is rooted in every insecurity I face. Am I good enough to be loved by God? It’s that simple. You may laugh, but how often do we play this game in our minds so desperately needing to feel worthy of our Savior’s love? We have been trained nearly from birth that almost everything is transactional, so it's no wonder we view our salvation through this same lens. God, I will give you my good works in return for your favor. God, I will be good in return for salvation. God, I will follow the rules in return for Your blessing. And then, when we fail to live up to our own standards and life does not go as planned, we are almost sure that God is punishing us for our lack of “goodness.” “Do better; I must do better, then things will begin to work out.” We make lists in our minds of all the things we must do to earn His love, sometimes, we even write them down as reminders in adorable planners with multi-colored pens. We tape them to our mirrors, and with all the intentions of a daughter who loves her Father, we still manage to let ourselves down. As it turns out, we are just not enough. I’M NOT A GOOD ENOUGH MOM. I’M NOT A GOOD ENOUGH WIFE. I’M NOT A GOOD ENOUGH FRIEND. I’M JUST NOT THAT GREAT. Can I just shake you? Can I just shake myself? And scream at the top of my lungs: BE STILL!!!!!!!!!!! JUST STOP! STOP IT!!!!!! LIKE, STOP!! 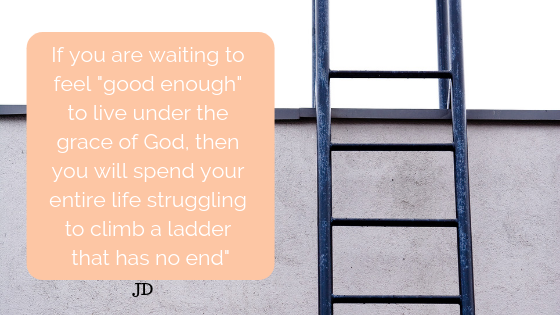 If you are waiting to feel “good enough” to live under the grace of God, then you will spend your entire life struggling to climb a ladder that has no end because you are much worse than you initially thought, my precious sister, and so am I. Wait, whaaaat? Yes, that’s right; on my best day, I am utterly incapable of being good enough to be loved by God. But believe it or not, this is not a woe-is-me post. Actually, it’s some of the best news the Gospel has to offer. At your very worst, He died for you, and the only ladder that indeed exists is the one in which He chose to climb down. God became flesh for you and me. He destroyed the ladder and our meaningless attempts to earn His favor because His love exists way beyond the boundaries of our efforts. When Adam and Eve blew it in the garden, they immediately went into hiding; ashamed and afraid, they hid behind fig leaves. One of the most beautiful scriptures to me is found in Genesis 3:9. This simple statement speaks to one of man’s deepest longings. Then the Lord God called to the man, and said to him, where are you? In the very midst of their shame, God came looking for them. We all long to be found by our Father, to be sought out and loved despite our shortcomings, to fill the daddy hole that is deep within us all, but so many times, we just do not understand this type of love. We do not understand this type of love because it is not typical of the love we dispense. When people hurt us or sin against us, it is rare that we seek them out. We often do the opposite, we mark them off our list and pour concrete down the hole they left behind in hopes never to have to revisit the pain. God doesn’t love this way. He loves perfectly. Not only does he come looking for us in the darkest corners of our hiding places, But He also does not come empty-handed. Fig leaves will never do for my children, He said, I will clothe them with skin. I will clothe them with myself. The blood of Jesus will be their covering forevermore. I will be their Father, and they will be my children, and there is no place they could ever hide where my love won't find them. What’s interesting about this post is that when I began writing it, it was about my own endless pursuit of trying to be good enough to be loved by God, but now, I feel the Lord laying a much different lesson on my heart. Man, I love when He does that. Maybe, instead of trying to “be better,” I need to learn to “love better.” Perhaps, instead of trying to feel worthy of His grace, I need to spend more time extending grace. The two greatest commands are, in fact, the greatest command. It has never been about us being good enough, but instead, it has always been about HIM being good enough. It’s not about our sacrifices, it’s all about His sacrifice. We do not present ourselves before the Father with our hands full saying, “look what I’ve done,” or “look how high I’ve managed to climb up the ladder.” We simply offer up the empty hands of faith that say, “Look what you’ve done, how could you do such a thing for me? Thank you, Jesus.” The realization that Jesus offered us something we never deserved should move us to show others that same sort of love. It should propel us to come down off our pedestals of entitlement to a posture of humility that looks forward to opportunities to extend grace. Love God. Love Each Other. This pretty much covers it.